Well, I've put over 125 miles on my bike odometer this trip! Hopefully by the end of today, I'll have turned the meter past the 500 mile mark since the day I added the odometer to the bike, a few weeks after I purchased my new Fuji. It is great easy cycling here, as the streets are long and flat with only a bit of a sea or bay breeze blowing in your face to keep you from hammering away at 20 miles an hour or faster. 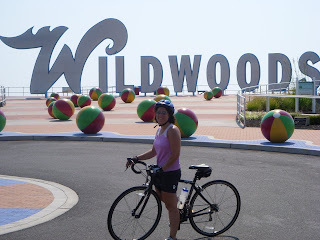 On Thursday, my cycling pal, Sue S. and I rode down to "THE WILDWOODS" aka ChildWood, aka Wilewould. For Sue, coming in from Ocean City, it was about a 50 mile round trip. For me, 6 miles closer and further south, it was a 43ish mile round trip. Very scenic, a bit hot and humid and absolutely fantastic way to see the scenic coastal highways and byways. It is a fascinating study of shore town architecture riding from one town to another over the course of the past two days and week. On Wednesday, I rode to meet Sue, and then we headed up to the end of Atlantic City. A real history lesson of how the shore has evolved and degenerated over the past 30 years since the Casinos came to AC. As I wrote in my earlier post, Margate and Ventnor are still beautiful and family friendly. AC, well, let's just say the casinos don't want you spending any of your time or money outside of their sin palaces. When you drive, walk (if you dare) or in our case, ride along the main streets, you can really see how everything is designed or not designed to make you only want to be in the Casinos. It's just plain ugly and scary. By contrast, the trip south to the Wildwoods was a study in the history of working class family vacation land. 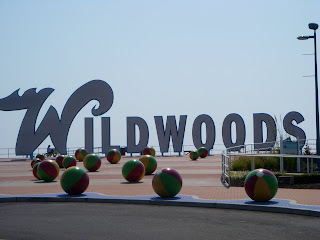 I am happy to report that Wildwood New Jersey is still home to several dozen "Doo Wop" Hotels and Motels, mostly along the strip of the town known as The Crest and Diamond Beach. While much has changed and many of the funky wacky motels are gone, casualties of the Condo craze, many remain. The Lollipop, Suitcase, Yankee Clipper, Waikiki, The Tiki, and other paeans to the late 1950's & early 1960's are still there in their resplendent glory, along with fake palm trees, totem poles and myriad of neon lights still glowing and thrilling visitors and old timers. 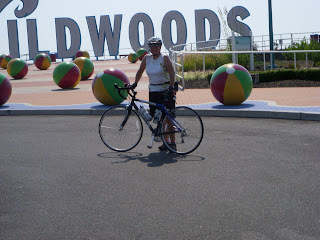 This is cycling Sue - stopping for a moment in front of the Wildwoods sign on the Boardwalk.